I love summer for so many reasons; the rain has finally subsided here in the great Northwest, I get to spend time with my family back east and one of the best reasons, impromptu summer BBQs with our neighbors and close friends. I’m the girl that loves to walk outside and see my neighbors, talk to my neighbors and have full on drinks and meals together…really as often as we possibly can. I think part of it is me as person that just loves to socialize, but also part of my culture. I recently read an article that my sister-in-law shared with me from the NY Times about “How to Throw a Relaxed Parisian Dinner Party”. It is the epitome of how I was raised. The article was about how this Beirut-born designer puts together elegant easy breezy gatherings with friends that are completely centered around food. Now, I’m not calling my summertime BBQs fancy or elegant, but the premise of the article was that friends and family should be enjoyed and celebrated ~ especially with and around food. I don’t need an RSVP from my friends to come over and spend time with me, but you better believe that the second you come over there will be food! We’re wired to connect with people and food is the gateway. We all NEED food and enjoy being fed. Summertime is the easiest time to connect with our friends. The weather is warm, everyone is outside and it stays light until past 10pm. It’s only natural to want to socialize and get together to BBQ. While most of my gatherings consist of much Lebanese cuisine, there are times when a good old fashion burger is just what is needed. Fresh beef seasoned with all the right spices tossed on the grill hit the spot! To make these extra special, I made some homemade hamburger buns which really brought these burgers home. In the burger world, a little fat is good. I’m all about lean meats and keeping things healthy but if you skimp on the fat content in a burger you won’t achieve the same juiciness you’re hoping for. I like to use 85/15 which is a good balance of lean meat to fat and results in a perfect, not too greasy hamburger. The trick to making the juiciest burgers is adding chopped onion to your mix. The onions begin to sweat while on the grill and make them so moist! Salt, pepper, Worcestershire sauce, Italian seasoning, garlic powder (or toum if you have) round out these burgers perfectly. 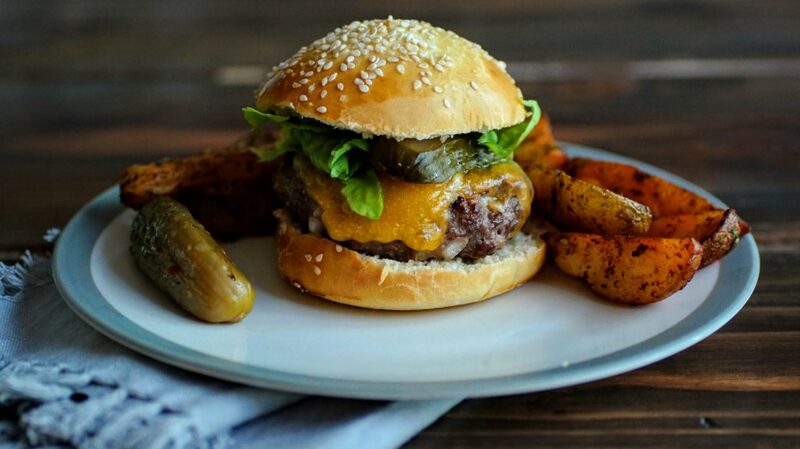 Top with homemade pickles and some good cheddar cheese and you have a worthy dinner. And then…you have the fries! Can one even eat a burger without fries? I’m not entirely sure! We literally have these oven baked sumac fries regularly around here. They are way better than anything frozen you’ll ever eat! Perfectly crisp edges, the imperfection of the slightly awkward cuts and tender centers make these dynamite. Oven baked in olive oil, coated in toum and finished with flake salt, pepper and sumac. The sumac spice is a bit lemony and tangy, it really brings the flavor up immensely. I hope you give these burgers and fries a try at your next BBQ! I would love to see your creations! Tag me on Instagram @CosettesKitchen or post on my Facebook Page. Place ground beef in a large bowl. Add in all the seasonings and mix well to incorporate. Form burgers into patties. 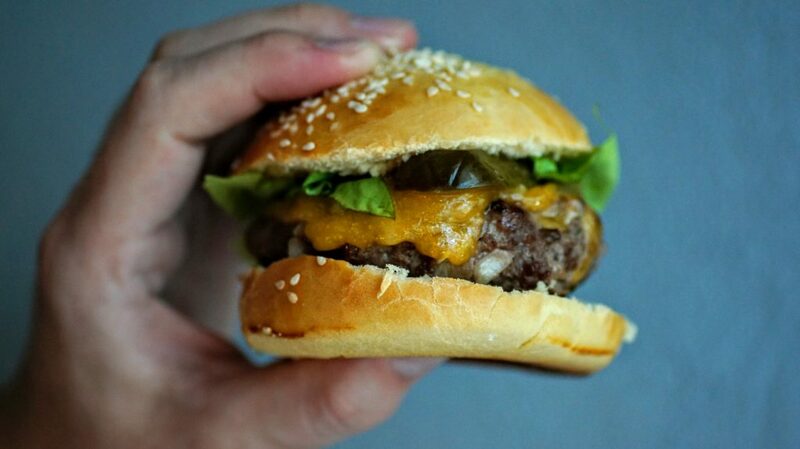 This recipe will make eight ¼ pound burgers or six ⅓ pound burgers. I tend to make smaller burgers for kids. After forming the patties, make a hole in the center of each burger. This will help to prevent the burgers from shrinking while grilling. Heat your grill to medium-high and place burgers on for 4-5 minutes and flip to cook another 4-5 minutes. If you’d like to add cheese, place a slice during the last minute of cooking to allow it to melt. Remove burgers from grill place on buns and top with pickles, lettuce, onions, tomatoes or wherever your taste buds lead you. Line 2 sheet pans with silicone or parchment paper; you may also use a non-stick sheet pan. Wash and trim potatoes to remove any blemishes. Cut in half, then cut each half into 4 wedges. Toss potatoes and all of the ingredients in a bowl EXCEPT the sumac, chives and flake sea salt. Line coated potatoes on sheet pans skin facing down and top of wedge facing up. Bake for 35-45 minutes rotating the pans every 15 minutes. After the first 15 minutes, using a spatula, toss the fries to re-coat and flip on the sheet pan so other areas become crisp. Continue to rotate and toss the fries every 15 minutes. 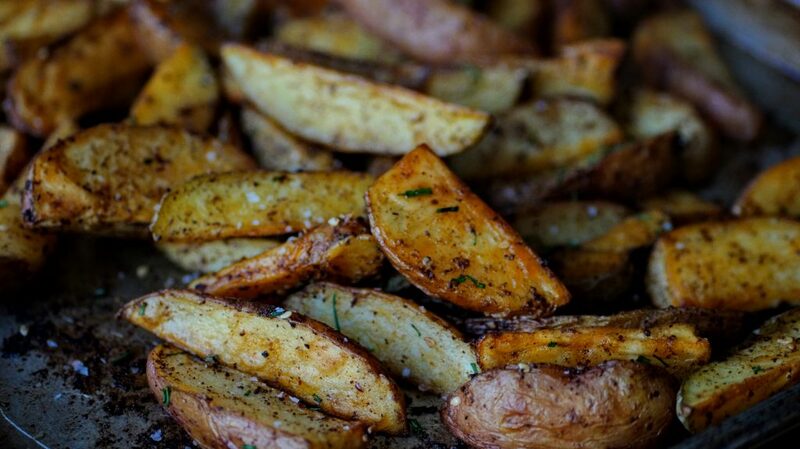 Once fries appear to have a crisp exterior, remove from oven and sprinkle with sumac, chives and flake sea salt. Toss to coat. Enjoy hot. Homemade buns were made using Taste of Home recipe. I adapted to use 2 1/2 cups bread flour and 1 cup all-purpose flour, egg washed the tops and added sesame seeds.